Part 1: What is 3D Printing? I started the program with a discussion about 3D printing, including some fun facts and some limitations. Most of the kids were already familiar with the basic concept of 3D printing, but they were interested in learning more about it. For example, did you know that the plastic used in a 3D printer is called Polylactic Acid (or PLA for short) and that it heats up to 420 degrees while printing? Another cool fun fact? PLA is biodegradable! Some of the limitations we talked about include size restrictions (our printers can print roughly 5 in by 5 in by 5 in) and color choice (one color per printer and we don’t switch colors until it’s used up). To get around the size limitations, you can make smaller parts separately and join them together to make something bigger. As for the color problem, my library tries to have different colors loaded in our 2 printers, so that patrons can at least have a choice. But even that doesn’t solve the problem if you want to print a TARDIS but one printer has yellow loaded and the other has red. (Who ever heard of a yellow TARDIS, I mean COME ON!) Still, maybe someday we’ll have 3D printers that can have multiple colors loaded at once. Until then, we’re stuck with yellow TARDISES (TARDI?). After our discussion about 3D printing, I introduced the group to Tinkercad. Tinkercad is a web-based program in which users create a free account and then design objects that can be printed with a 3D printer. Tinkercad is extremely user friendly and has great tutorials. The only glitch is that you have to be 13 years of age or older to create an account (and you need an e-mail address). To get around this, I had the parents create the accounts using their own e-mails and birthdates. Many of the kids chose to go through some of Tinkercad’s tutorials prior to making something on their own, while a few kids decided to just jump right in and start creating. Like I said before, Tinkercad is very user friendly and when kids did run into questions, I was able to help them. I also introduced the group to another website called Thingiverse. 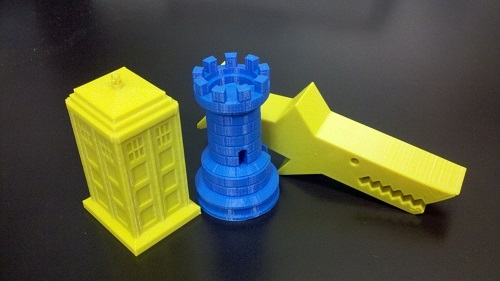 Thingiverse is an online repository of 3D printed objects that you can download to Tinkercad and print. About half the kids went to Thingiverse and downloaded TARDISES (TARDI?) and Minecraft creepers. The other half spent time creating objects on their own. Because 3D printing requires a lot of time (even some of the simpler objects can take 20 minutes), we were unable to have everyone print their objects during the program. Instead, I printed something and showed them as a group how to do it. After the program, I e-mailed each participant a certificate for one free 3D print at our library so that they can come back on their own time and print it themselves. So how do you 3D print things from Tinkercad? It’s simple! First, you download your object to a USB drive. You can do this in Tinkercad by going to Design –> Download for 3D printing –> select .stl. Once you have your object saved, plug the USB drive into the computer that’s connected to the 3D printer. My library uses Makerware software to print 3D objects, so if I were printing something, I would open up Makerware, navigate to my USB drive and open the document I want to print and print it. There’s a few more details/steps that I won’t discuss here because they really don’t make sense until you can actually see what you’re doing, but I assure you it’s all pretty simple. Once your object is finished printing, you can take the tray out of the printer, use a putty knife to scrape it off the tray, and VOILA! you’re done. 1) There was an equal number of boys and girls in attendance! We had 6 boys and 6 girls come to the afternoon program and 4 boys and 4 girls come to the evening program! Awesome! 2) This program drew dads into the library! Okay, dads have been coming to the library a lot lately…I see them in storytime all the time! But this was a program that dads really took an interest in, many of them asking me questions and following along on Tinkercad as I taught their kids. Also Awesome! This is interesting. 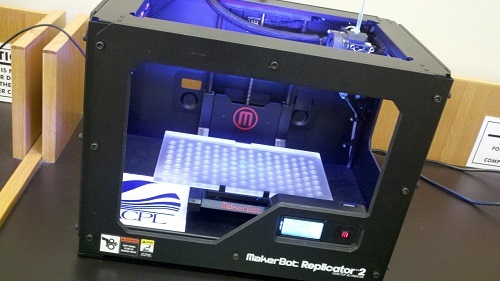 I have never seen a 3D printer, and doubt that we will have access to one in our library for a long, long time. How much does it cost for a patron to print something? What do people typically use it for? Is it more just a novelty of using the printer, or do they actually have a useful purpose for creating something? It’s a $3 flat rate per print. Patrons use it for a variety of reasons — some just want to print something for fun, others are printing for a purpose. Amazing. I’ve never even seen one and you’ve got one. How much fun that would be. I need to come and visit just to play with your printer.